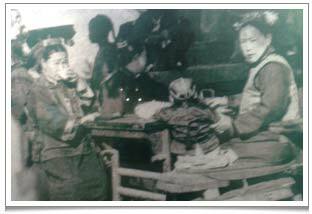 Women from the Qing Dynasty, likely to be from a very well to do family, enjoying tea at a teahouse. Note that the chair is rather high compared to the table. This is typical of Chinese furniture. We use such traditional antique furniture at Chaya Teahouse. The earliest recorded example of the commercial selling of tea as a beverage is a reference by Lu Yu in his classic Cha Jing (茶经 The Treatise of Tea) to an elderly market seller during the third century AD who was well known for carrying around huge urns of “Yuhua” (雨花 “rain flower”) green tea to sell along the street market. Her business was brisk and she donated most of her proceeds to the poor. Over time, her customers noticed that her tea urns were never empty, even though she sold tea the whole day. The reason was that she kept adding hot water all day, as is perfectly possible with good quality teas. But the townspeople thought that she must be practising witchcraft, and they locked her up in a prison cell. When night came, so the story goes, she flew out through the tiny prison window, taking her urns with her! By the time of the Tang dynasty, the planting of tea was already widespread and tea drinking was commonplace. There are records to show that in the then capital city of “Chang An” (长安城) there were tea markets as well as tea huts, tea pavilions, tea rooms, tea houses and even tea societies, often attached to existing, local inns used by travelling businessmen. Following the popularity of tea drinking during the Tang dynasty, the Song dynasty saw the establishment of tea workshops and teashops. Almost every city and town had a tea market. Also common were mobile tea sellers who would move along the streets selling ready-brewed tea. Traders during this time started to promote their teas by having beautifully decorated tea houses with calligraphy hangings and bonsai plants. This reflected the interest in and appreciation of all art forms under the Song dynasty. It was also during this era that imaginative teahouse owners started to sell seasonal teas according to the time of year. 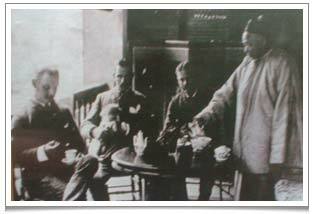 Western officials enjoying a cup of tea at a Chinese teahouse. Note that the gentleman on the left is holding a Western cup and saucer whereas on the table on the right there is a Chinese gaiwan tea cup. The Ming dynasty saw the teahouse develop into something yet more elegant and refined. Ming teahouses placed a lot of emphasis on the quality of the water used, the tea leaves and tea utensils. It was during this era that the Chinese started to brew tea using loose tea leaves, so that much of the equipment designed for boiling crushed bits of tea from compressed tea cakes was found to be no longer suitable. It was in this period that tea pots were designed and tea cups started to be made from porcelain with the blue glaze that we are so used to seeing now. The purple clay (宜兴紫砂 Yixing zhisha) pot also acquired great popularity. This was also the time when other forms of entertainment entered the teahouse. One could watch a songstress perform or listen to a storyteller tell the gripping tale of the 108 heroes from the Water Margins or other romantic classics. The teahouse started to perform an important educational function especially for the unskilled and uneducated. Under the Qing Dynasty specialised tea shops, stores and businesses appeared one after the other. In Hangzhou, Wenglongsheng (翁隆盛) tea company was founded in 1730. It gained great repute for the quality of its very early harvest Hangzhou Dragon Well green tea. Shanghai’s Wangyutai (汪裕泰) was another firm well known for selling black and green teas from Anhui province. Meanwhile teahouses spread all over China. Some of these, known as ‘Qing Cha Guan’ (清茶馆, “purely teahouse”), focused only on selling tea. They were frequented typically by refined scholars and were decorated gracefully with delicate calligraphy and poetry hangings. They used gaiwan tea cups of fine porcelain or purple clay tea pots fashioned from Yixing purple clay. A more rustic style of teahouse was called ‘Ye Cha Guan’ (野茶馆, ‘countryside [wild] teahouse’) and served tea with simple clay utensils. Other types of teahouse served little snacks as well as tea, and yet others served larger meals and alcohol and sometimes provided entertainment (those with entertainment were called “Cha Yuan” (茶园, ‘tea garden’). The teahouse I wrote about in my recent blog post on the TV serialisation of Lao She’s Qing-era drama “Cha Guan”, was just such a ‘tea garden’. Characteristically, it would have a special table reserved for a trusted, wise old sage to whom people would bring their grievances and disputes. 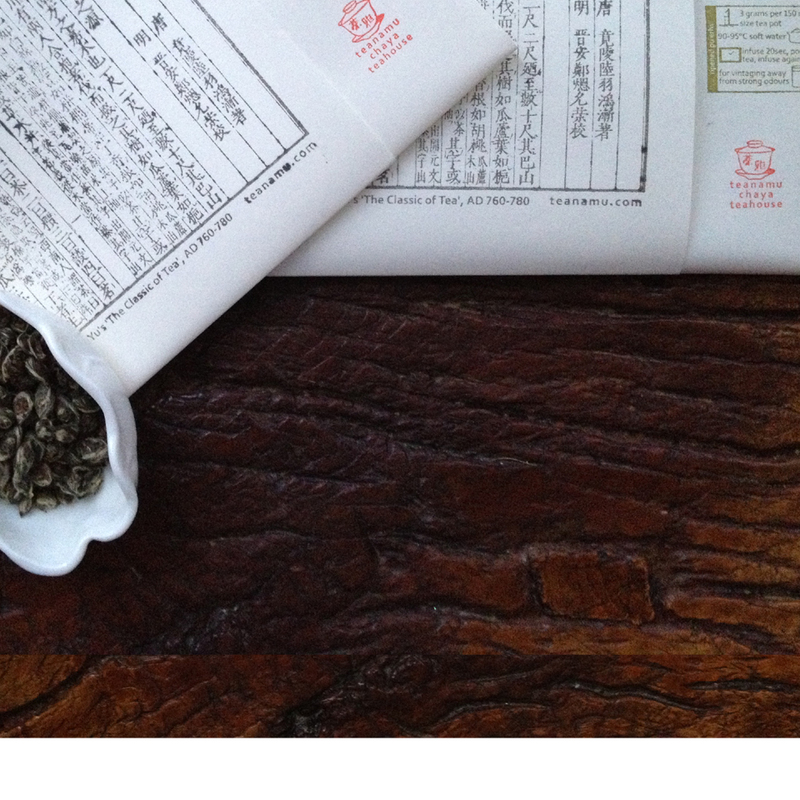 Approximately 25,000 tea houses operate in China today, pretty much like the ‘Cha Yuan’ of yesteryear, and I am so happy and honoured to be continuing this tradition at teanamu chaya teahouse in London and taking it forward into the 21st century.